You can read the interview “Petri Purho and the Art of Making Games Every Month” by Jarkko Laine over at his blog. The interview is part of his Insanely Interesting September -series. During the month Jarkko writes articles and interviews people who have an mentally unstable interest in something. And while I’m a bit honored to be dubbed as “Insanely Interested in Making Games”, there are game developers out there who are clearly more insane than me. Btw. I reread the interview and there’s a part there where I say that making games requires a “huge range of different skills”. I didn’t mean to brag that I poses all those skills (the only skill listed there that I can comfortably say I poses is programming). What I meant to say is that when making a game by yourself there are all these skills you should poses. And at least for me every time I make a game there’s a voice in the back of my head telling me that I should really learn this or that skill properly. So the reason why I’m interested in making games is that there’s always something new to try and learn. logr left a great comment on the original Crayon Physics thread. I was a little afraid it might go unnoticed there, so I decided to post it here. 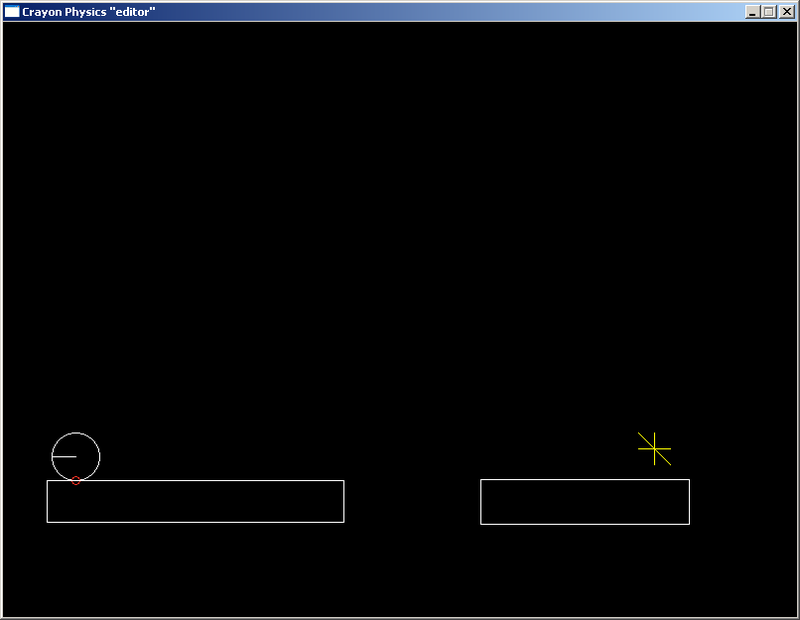 It’s a level editor tutorial. I did some small editing and added the screenshots, but you really have logr to thank for it. logr also wanted to remind people that there is a level editor available in the first place and there are a dozen user made levels you can already play. logr already has a bunch of them and you can download them from his public box. Well enough talk here’s the tutorial. First of all, download the level editor pack (it’s in the June archive, top of the page), then unzip the files. Now you have a choice to make. You can unzip the files to a new directory or you can unzip and copy them to the same folder where Crayon Physics (“crayon.exe” and the dll -files) is located. If you copy them to the Crayon Physics folder, then you can more easily test your levels. But if you unzip them to a separate folder, it’s easier to manage and to observe how the editor works. I recommend you to unzip your files to a separate folder. 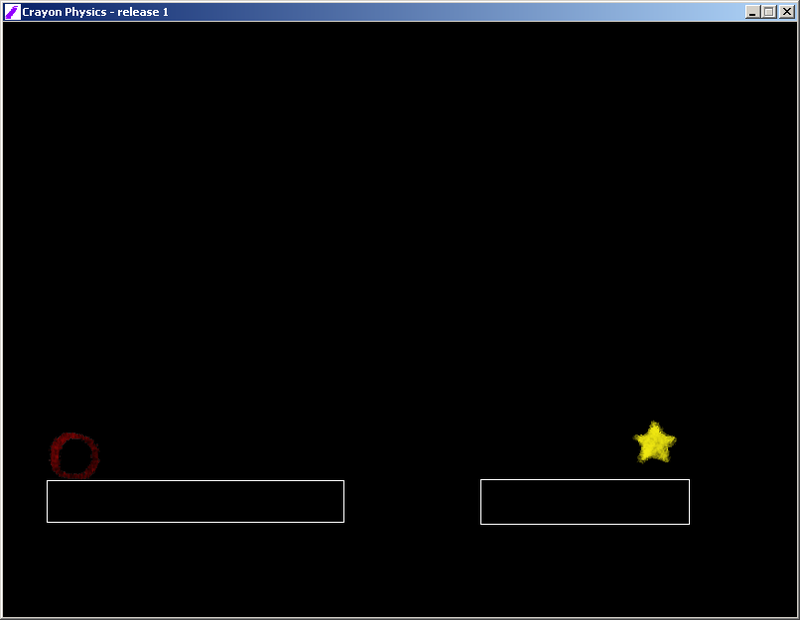 Then you should think about your level : just draw the main parts (the ball, the star(s) and the walls) on a paper sheet. Don’t pay attention to any background now, for the editor really doesn’t care! Now you can start the “Crayon editor.exe” file. You should see something like in the screenshot above. You’ll first have to name your level ( “data/levels/test.xml” is perfect, since you’ll be able to change everything when done with the editor). The editor will ask something about creating new level, just answer yes. 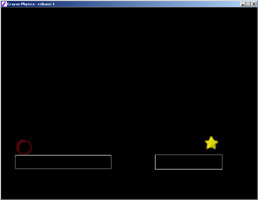 When you are faced with the black screen (like the one in the shot above) push S to register your level (S saves the level). Now that you know the shortcut keys, just draw your level (don’t mind the black/white colors until you’re done with the editor). Remember to push S when you’re done. You should now have at least two new files in the data\gfx folder : the bmp and the xml files. There will also be a xml file in the data\level folder. If you’re working in the same folder where “crayon.exe” is located you can skip this next step. 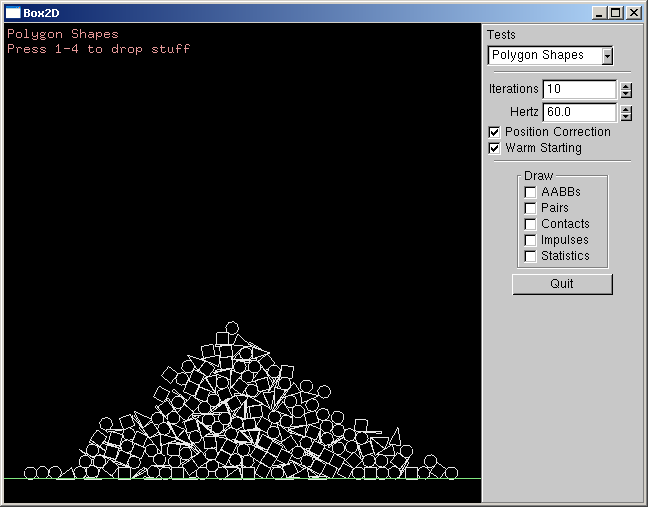 Copy the files from your gfx -folder to the data/gfx folder of Crayon Physics. 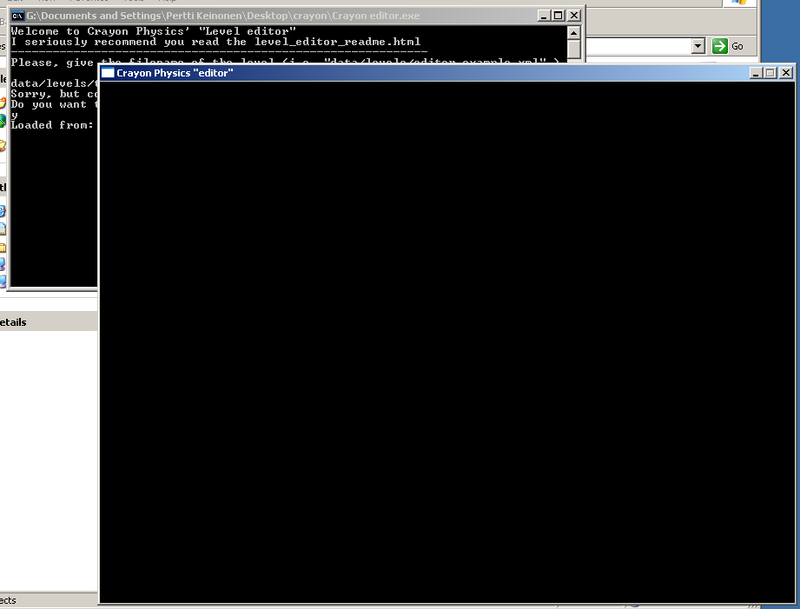 Also copy the xml file from data/level folder to Crayon Physics’ data/level folder. of course in the place of test.xml put in the name of the file you gave for your level. And remember to save the file. 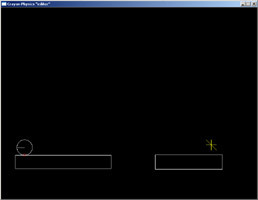 You should see the level you created in the editor (with the black background and all). -then open the 2 files with Paint. 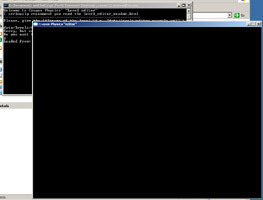 -push ctrl+I in the first file to exchange black and white, then ctrl+A. -Paste it on your background using the “transparent paste” (I don’t know how to put it in English). -On your background, you should now have black lines (boxes) covering it. -Just fill the black boxes with anything you want to get your own platforms. Now you’ve got it! Just save and rename your background so as to replace the black/white background. All that is left to do is test it again with the new background and have fun playing it. 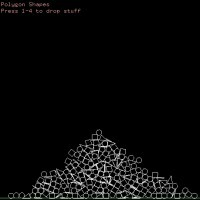 Erin Catto’s Box2D, the physics engine that I’ve used in Crayon Physics, TAFB and in Rolling Boulder gets a huge update. Erin promised that there will be new features implemented soon (these would include other collision shapes) and I’m sure the project finds enough contributors to keep it healthy and alive for a long time to come. Now I’m off to testing what kind cool things the new engine can do. I rarely do this news reporting thing, because there are sites that do it faster and much better than me. But from time to time I do expectations and this is one of them. On his blog Martin (of prototyprally and Argblargs fame) has been running this interesting series of articles called: “The games that didn’t make it”. In the series he introduces some of the games that he has created in the past that were never published. He openly shares the early prototypes of these games, so you can get a pretty decent idea why he decided not to finish those games. It’s a rare delight to see someone publishing their failures. It takes balls. You can learn a lot from reading the descriptions of the games and the reasons why he decided to scrap the games. There are already two games out there. First one is Rain, a game where you control a cloud. It uses an interesting mouse movement recognition system for controlling the cloud. The second one is Flu Fighters. 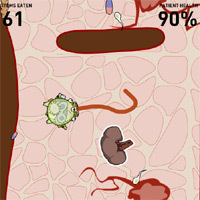 A nearly complete game, where you control this disease eating creature and try to keep the organs as healthy as possible. I hope Martin continues this series and possible even publishes couple of new games that did make it. For the past couple of days the web server of Kloonigames was down. My service provider shutdown Kloonigames, because it was using too much resources. So Kloonigames is becoming too popular of a website? But now we’re back, hopefully permanently. I’m sorry for the inconvenience that downtime might have caused. I try to make sure nothing like this happens again. And thanks for everybody who informed me that my site was down. You are currently browsing the Kloonigames weblog archives for September, 2007.